Established in 1970, under the supervision of former GB goalkeeper Bill Holderness, it didn’t take long for the Eagles to find their feet, winning their first Women’s league title in 1977. The club was then known as the Graphite Eagles while being sponsored by Graphite Composites and later Robert Jenkins when they bought Graphite Composites. The Eagles women’s team enjoyed a fierce rivalry with Wakefield while the Men had many close battles with both Brentwood and Liverpool. The women have enjoyed greater success over the years, and in 1982 became the first UK team to win a tie in European competition by beating the Belgian Champions over 2 legs. Domestically they enjoyed an unbroken streak of National league and cup doubles from 1991-2006 as well as 2008, 2009, 2011 and 2012; all overseen by former women’s coach, player and GB Coach Mel Chowns. 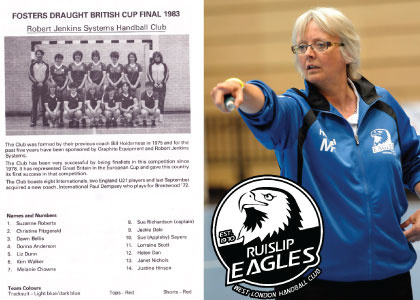 Mel was awarded the first ever lifetime achievement award by England Handball in 2014 as recognition of over 20 years’ service to the Eagles and handball in the UK. Our men’s team are no pushover either, finishing in the top 4 of the Super 8 the Eagles are frequent visitors to Europe and the EHF Challenge Cup. After the tournament format of the 2012 competition, the 2013 edition saw the Eagles come close to an upset again HC Spartak Varna of Bulgaria. 2014 saw the Eagles visit Belgium to play HC Vise BM and in 2015 the Eagles took on the eventual winners ABC/UMinho of Braga in Portugal. While the Eagles often find themselves outgunned in Europe, the pride of flying the flag for English Handball ensures the Eagles put in spirited performances. The Eagles are very active in London and we are a founding member of the London Handball association with our second teams competing in the South East Regional Leagues. In 2013 the Eagles began a programme of Junior development in line with the requirements of the EHA Super 8. The 2014/15 season saw the Eagles form an official partnership with Ealing Handball Club, a club with a good track record of producing future start including Ealing, Ruislip and GB player Oliver Bray. Also enjoying a fruitful relationship with Brunel University HC and Imperial University, the Eagles talent pathway continues to develop and offer plenty of opportunities for new and old players to #SoarHigher. In October 2016 the club decided to leave the Ruislip name behind and start a new era as West London Eagles Handball Club. We hope the new name will bring as much success as Ruislip did! You can read more about the history of the club here.